Vietnamese State President Tran Dai Quang has referred to fellow leaders of the 21-member Asia-Pacific Economic Cooperation (APEC) bloc as “brothers and sisters” as he delivered his welcome address at a gala dinner ahead of the forum’s summit in the central city of Da Nang. 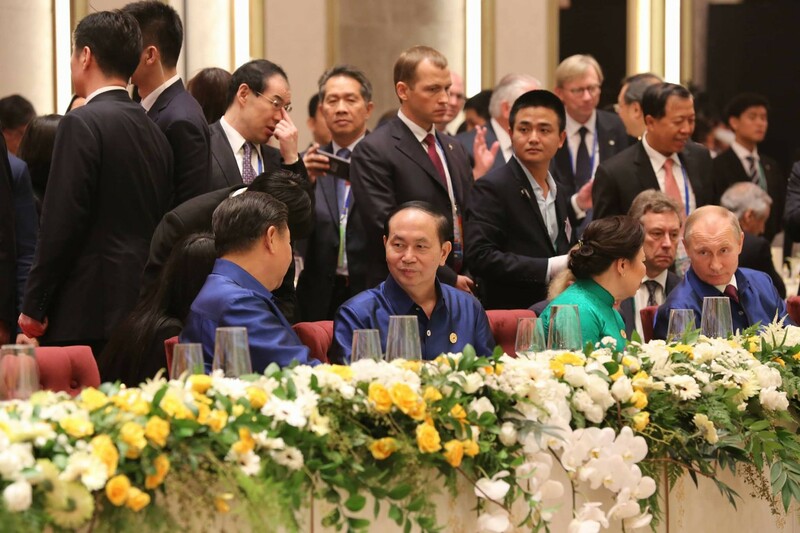 On Friday evening, President Quang and First Lady Nguyen Thi Hien played hosts to the official reception of the APEC leaders who had gathered in Da Nang to attend the annual leaders’ summit the following day. Established in 1989, the APEC grouping is a regional economic forum comprised of 21 Pacific Rim member economies that work to promote free trade in the region. The leaders, adorned with navy-blue and ivory shirts made from top-quality Vietnamese hand-woven silk, upheld a long APEC tradition to pose for a group photo in the traditional costume of the host country, before entering the main venue at Sheraton Danang Resort for the gala dinner. “Once a battlefield, the Asia-Pacific region is now the cradle of economic miracles,” he added, stressing that such success had been founded on the strong belief in the power of cooperation and dialog. President Quang reminded fellow leaders how APEC has grown over its 30-year history into a premier regional economic forum and “an incubator for ideas and initiatives” on growth, integration, trade and investment liberalization. “We gather here today as the regional and global economic outlook is seeing better prospects,” he said, recounting how the world has recovered from the 2008-2009 economic crisis, and how growth in Asia-Pacific has been nearly twice as fast as the global average. In 1994, APEC members convening in the Indonesian city of Bogor set the goal of free and open trade and investment in the Asia-Pacific region, better known as the Bogor Goals, according to which developed members have until 2010 and developing members, including Vietnam, until 2020 to achieve free trade and investment. The gala dinner’s menu was put together to treat APEC leaders to a feast of Vietnam’s finest cuisine, including courses that showcased a variety of Vietnamese seafood and dishes only served to Vietnamese kings in the past. The leaders had dinner while enjoying art performances prepared by the host country, and beholding the beauty of Vietnam through promotional videos that appeared on a big screen. The food was served in top-quality Vietnamese porcelain decorated with Golden Lotus patterns, a symbol of royalty, designed exclusively for the event.